It was shocking enough that Yushchenko had been poisoned—and nearly killed while on the campaign trail. When reports came in of blatant voter intimidation and damaged ballots, people were outraged. When they realized election officials were in on the fraud, the people had had enough. For 17 days, a group of ordinary citizens engaged in extraordinary acts of political protest. Through the eyes and in the voices of the people in Ukraine, Orange Revolution tells the story of a people united, not by one leader or party, but by one idea: to defend their vote and the future of their country. A free companion Study Guide (PDF) for the film is also available for download. 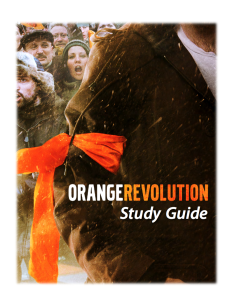 Designed for high school and college use, this 16-page Study Guide contains a synopsis of the Orange Revolution, historical information about Ukraine, brief biographies of major characters, color photos, a timeline, discussion questions, research activities, and additional resources. Our Resource Library contains hundreds of educational resources on civil resistance in English and over 65 languages. Many of these are available for free download. Want a place to start looking? Check out our list of short introductory materials.